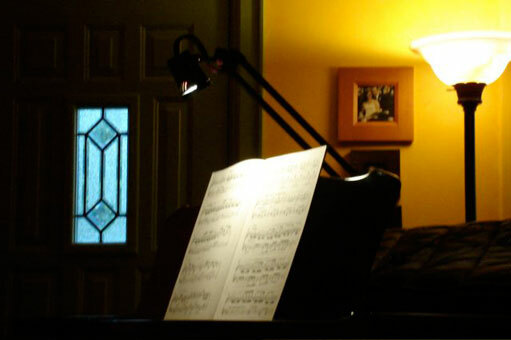 Sue is a repeat customer whose studio is equipped with Concert Design Piano Chair, Pearl*Lite Grand Piano Lamp, as well as Allegro Chairs and Pearl*Lite Performance Lamp. Check out the posture on this young man! Concert Design writes: This piano chair, purchased five years ago, has our previous anti-rotation clamps on the gas shock (2 PVC clamps total). 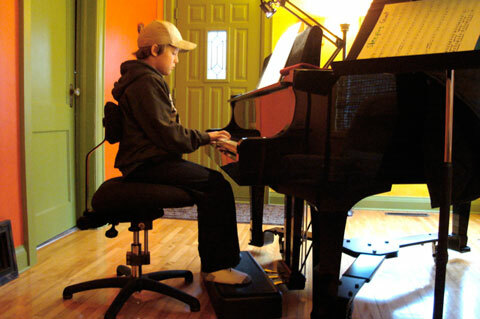 Any piano chair can be updated to our restyled anti-swivel method of only one clamp at the top of the pedestal shock. It is exciting to see that the chair is performing well. Designed to last! NOTE FROM CONCERT DESIGN: The back support is placed correctly and supports the back without conflicting with arm movement. The Interval Piano Chair augments proper posture, maintaining and supporting the body. The piano, after all, is played with fingers, the body and arms support the hands and fingers.The waterfall design of the front seat edge is extremely important in preventing future medical problems; a slight forward tilt is important also. More of the seat pan can be used when a forward tilt is used. This eliminates ‘perching’ on the seat edge to angle the legs properly to the pedals. Concert Design Pearl*Lite grand piano lamp.